Franzen’s latest in a long line of tirades against all things “modern” is headlined Jonathan Franzen: What’s Wrong With the Modern World. Did you ask Franzen to tell us what’s wrong the the modern world? No, the chutzpah native to the creature, it seems, is such that he finds it necessary from time to time to deliver himself of a few incendiary comments about how we’re all going to hell in a Hustle bag. “Technology-crazed.” Crazed. Did I mention melodrama? I’ll just offer you a few quick excerpts here, leaving you to decide whether to subject yourself to the full and fulsome experience of a complete read. One of the worst things about the Internet is that it tempts everyone to be a sophisticate – to take positions on what is hip and to consider, under pain of being considered unhip, the positions that everyone else is taking. Funny, I find the Net to be crawling with something other than sophisticates. I must be hanging with the wrong crowd-sorcerers. It’s not clear that Kraus’s shrill, ex cathedra denunciations were the most effective way to change hearts and minds. But I confess to feeling some version of his disappointment when a novelist who I believe ought to have known better, Salman Rushdie, succumbs to Twitter. Or when a politically committed print magazine that I respect, N+1, denigrates print magazines as terminally “male,” celebrates the internet as “female,” and somehow neglects to consider the internet’s accelerating pauperisation of freelance writers. Those were Kraus’ “shrill, ex cathedra denunciations,” right? Before Rushdie “succumbed” to Twitter, right? Succumbed. Consider that “what Amazon wants” business. Franzen now knows what Amazon “wants?” He’s what, in the boardroom? In Bezos’ office closet? @MaraWritesStuff his prose is outstanding but his views are idiotic. Imagine the best written chain emails ever. He’s not only biting the hand that feeds him (and many more authors and their readers) but he’s also chewing the legs off the market that supports him. He sells his books on this Amazon-of-the-Apocalypse, the corporate desires of which he claims to know. And he sells them as ebooks, not just holy print. So the physical book goes on the endangered-species list, so responsible book reviewers go extinct, so independent bookstores disappear, so literary novelists are conscripted into Jennifer-Weinerish self-promotion, so the Big Six publishers get killed and devoured by Amazon: this looks like an apocalypse only if most of your friends are writers, editors or booksellers. I’m not entirely clear on what Weiner-ish self-promotion includes, or how it might be different than what other writers are doing—which is weird because, as its foremost practitioner, I should know…In 2010, I coined the hashtag Franzenfreude. It was very bad German for a very real problem: When Franzen’s most recent novel, Freedom, was published, newspapers and magazines devoted thousands of words to the book and its author, while giving other literary books far less attention, and, in some cases, ignoring commercial works completely. Perhaps Franzen’s recent name-check was payback for when I implied that he was the face of white male literary privilege, or for pointing out that he’s the kind of writer who goes on Facebook only to announce that he won’t be doing Facebook, with the implication that he doesn’t have to do Facebook, because the media does his status updates for him. And “shrill, ex cathedra denunciations,” did Franzen say? Maybe nobody will care about printed books 50 years from now, but I do. When I read a book, I’m handling a specific object in a specific time and place. The fact that when I take the book off the shelf it still says the same thing — that’s reassuring. Franzen boomerangs back to us right at the end of this diatribe, but not before getting to thermonuclear warheads. He calls the Nook “a superior e-reader” and mentions “Chinese-made ultra-low-cost porch furniture at Home Depot.” As I said, it’s a long piece. Whether I like it or not, the world being created by the infernal machine of technoconsumerism is still a world made by human beings. Maybe apocalypse is, paradoxically, always individual, always personal. I have a brief tenure on Earth, bracketed by infinities of nothingness, and during the first part of this tenure I form[ed] an attachment to a particular set of human values that are shaped inevitably by my social circumstances. If I’d been born in 1159, when the world was steadier, I might well have felt, at 53, that the next generation would share my values and appreciate the same things I appreciated; no apocalypse pending. But I was born in 1959, when TV was something you watched only during prime time, and people wrote letters and put them in the mail, and every magazine and newspaper had a robust books section, and venerable publishers made long-term investments in young writers, and New Criticism reigned in English departments, and the Amazon basin was intact, and antibiotics were used only to treat serious infections, not pumped into healthy cows. Kraus was the first great instance of a writer fully experiencing how modernity, whose essence is the accelerating rate of change, in itself creates the conditions for personal apocalypse…As long as modernity lasts, all days will feel to someone like the last days of humanity. SLIDESHOW: 100 Twitter Feeds by Novelists More Interesting than Jonathan Franzen. So…what has happened here? What’s wrong with the not-at-all-modern, 54-year-old Jonathan Franzen? @samatlounge You are the best conference flogger I know. The Kraus Project is essays, in the original German and in Franzen’s translations, with Franzen’s commentary in notes. As a Publishers Weekly review has it, “Several footnotes extend for pages, turning Kraus into background music for scholarly speculation and ruminations” from Franzen. Publishing Perspectives’ Dennis Abrams has excerpted some of Franzen’s Guardian essay in Franzen Says Amazon Presages the Apocalypse. Kraus was writing in the midst of the Austro-Hungarian empire, which looked invincible at the time, but came to a demise during his lifetime. Franzen would do well to consider this when talking about Amazon. Empires come and go, come and go — and not infrequently the ones that look unstoppable fall the fastest. Jonathan Franzen, the sometime critic of Oprah Winfrey, Facebook likes, non-birdwatchers and overly difficult novels, is at it again. Mr. Franzen may despise the ephemeral social-media slipstream that conveniently blasted news of his book out into the world. But how much is timeless dead-tree literary discourse really paying attention to him or other literary novelists of his generation? Someone needs to do something about all these BOOKS in my OFFICE good lord, people. That’s how crazily Franzen has nipped on over to the cliff’s edge of public opinion. Is he unaware that he’s on the verge of making himself a laughingstock on some issues with which we could use some serious help? He’s the one in need of help now. The pile-on of criticism, by those whose pants are sagging and otherwise, is probably earned. Those shrill, ex cathedra denunciations in the essay, you know; they may not work as well today as they did for Kraus in Vienna. A bit of a rescue effort, and a good-hearted one at that, lies in the writings of Maria Bustillos at the New Yorker in Jonathan Franzen, Come Join Us! Franzen is a nostalgist, and he wants to preserve the traditional values and practices of the book world at all costs, and can therefore come off sounding pompous about “high culture.” Plus, he is, as he admits in the essay, a little off when he characterizes certain matters of contemporary coolness. Somehow, she manages to say that Franzen is off-track, and that even his writings are “endearingly weird,” but that he’s “the only American novelist of my generation (that I know of) who writes with absolute clarity, conviction, and meaning about the world I live in every day.” We may not all live in quite so “endearingly weird” a world. I’m still with Bustillos, however, firmly. For one thing, she makes an excellent point being joked about online by many: Franzen isn’t hearing this debate. I believe that Franzen gets into these scraps because his detractors haven’t the slightest fear that he will reply. He won’t: he has no Twitter handle, no Tumblr, no online persona at all. Yes, there are many bad things about the Internet, but serious criticism is alive and well there…There are thousands upon thousands of passionate constituencies online—political, social, literary—many of them eager for the participation of as many principled, serious artists as care to come out and talk. Come on in, Mr. Franzen! The water’s fine. Holding your breath? I’ll bet Bustillos isn’t either. But it’s a generous gesture she’s making and it’s the stance that wears best and most healthily on any good community—brushed aside by Franzen or not. I’ve stopped to ask myself whether I’d be comfortable if Franzen read this Ether: yes. Bezos is said to have kept an empty chair at the table in some meetings to represent the all-important customer. We can do the same for Franzen. Mindfulness is not a bad thing here. And can we love this author again? After yet another time-eating, noisy blowout about his attitude? It’s up to each reader. Still a talented fellow, no question. But Franzen has become high-maintenance in a way that’s damaging his own reputation. If anything, we end up looking at an example of what appears to be a disconnected author, at a time in which we stress an author’s reader connection and development of community engagement. Rather than reading Franzen riffing on Kraus?—I’d love to read Kraus’ take on Franzen. And how about you? 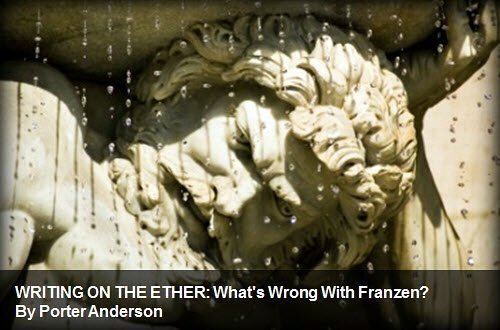 The gracious Bustillos writes, “The whole thing struck me as eminently silly in the first place.” Is the Franzen fracas simply silly? Or is it more serious? What does it tell us about writing today? Posted in Writing on the Ether and tagged agents, Amazon, ebooks, Jonathan Franzen, Karl Kraus. Seems Franzen is using the internet quite well to promote his perennial bad mood. I saw the headline yesterday: “Franzen Says Amazon Presages the Apocalypse” and had to laugh. Another great post, Porter. Try NOT to presage the Apocalypse. Seriously, thanks, I fear Mr. Franzen has indeed probably triggered more laughter than he intended — or even knows. Which might be merciful. Franzen is getting publicity for his book, that’s for sure. As for his views on e-books… ummm… no. Yeah. Pretty well said there, Joseph. Ummmm…no. I don’t question Franzen’s prose at all, it belongs in the “Writer’s Hall of Fame” for sure. I think the fact he doesn’t “deal with change very well,” as you put it, contributes to his awkward nature. First time I’ve seen mention of Huis Clos in a comment thread. Well done, sir. Anti-social writer runs successful viral social media campaign. You, Porter, are awesome. If there was such as thing as awesome-sauce, I’m fairly certain you would be an ingredient in it! Thanks for the laugh. As for Frazen, I don’t experience the world as he does. Right indeed, and this is one of the most ironic questions of the #Franzenian fray, really, Kirk, the question of whether we would even be aware of his diatribes if they appeared, say, in a print edition of The Guardian and not online. Only thanks to the networked world he rails against are we able to have these intercontinental debates about what he has said. It’s close to something out of O. Henry. Getting older is tough. Especially when you’ve become “master of your domain”. Because the domain changes. If you don’t change, you’re no longer master. This is Franzen basically saying, “You kids get off my lawn.” It’s embarrassing. But it’s also–as your wise commenters have pointed out–very good Jennifer-Weinerish self-promotion. That indeed is one of the main topics of today. Nick Ruffilo was chatting with me very early today, wondering if this behavior from Franzen is “just crazy” or “smart crazy” ( to paraphrase ). As I told him, I think the intent here is earnest, but there sure is some good Jennifer-Weinerish self-promotional resulting from it, even if it’s not the intent. I do think this book will a very different sell from the novels, which should make it interesting to see it play on the market. I love it when you get on a roll, Porter! Franzen’s piece sounds completely insufferable, and I am grateful to have to read only your quotes of it. I would happily get off Mr. Franzen’s lawn if he would stop trying to torch the playground. His piece reminds me of another in The Guardian last year, by Ewan Morrison. Barry Eisler did a nice UK radio debate with him, handily demolishing his apocalyptic fervor about authors and social media, as I recall. Well, I was born in 1964, and my personal memories of Innsbruck, the first Beatles album, Sidney Poitier’s Oscar, and the Warren Commission Report inform who I am today because … oh, wait—no, they don’t. You know why? Because I was a baby, and I don’t recall a damn thing. And that may be what qualifies today as bliss, Michael, LOL. Thank YOU, sir—you are too kind. Yes, I read the whole thing — Frazen’s essay, when it first came out in the Guardian. And I read all of Maria Bustillos’ essay. I’ll take Ms. Bustillos, thanks. The Corrections knocked my socks of and I loved Freedom (I even blogged about it), so I am a Franzen fan. (I am a fan of good writing, full stop.) But lordy, lordy, he is a cranky ol’ curmudgeon, isn’t he! I’ve had some good laughs in the last couple years at some of his old-fart pronouncements … but as you point out, he’s on the cliff’s edge, getting ready to step off into irrelevancy. Shame, really. LOL Glad to have saved you the trouble, Jamie, thanks much for the good comments. It is a shame. Almost a “noble mind o’erthrown,” apparently, by his peculiar level of distress at how things are going. I fear the very thought of space travel might kill the guy, lol. . I enjoyed your comment and agree. 😉 Melodrama it is . Best selling male ivory tower regardless, the Franzen is a get-off-my-lawn whining troll. It’s a shame this troll’s stature gets him fed, instead of us getting to use the best practice of attention starvation. Thanks for the input, Anthony, good to have you on the Ether!